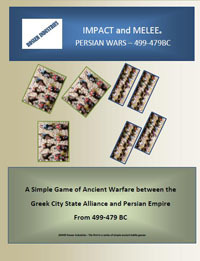 A Simple Game of Ancient Warfare between the Greek City State Alliance and Persian Empire From 499-479 BC. Game pieces are represented by top down full color photos of Greek and Persian warriors of the time of PERSIAN WARS (@499-479 BC). Ken Filewood 7 3 5 Played twice. Seems to very similar too former free offering at Phil Sabin's old site. Rules simple with some elegant bits, but too terse: had to make up how to play.